In the studio, we worked on marbling handmade paper with ink, using the Suminagashi technique. Suminagashi is a Japanese paper marbling technique using sumi (black) ink. By dropping it lightly onto the surface of water, the ink is able to stay floating on the surface of the water. While the ink is floating on the water’s surface, it can be shaped and marbled in organic designs by blowing on it through a straw, as well as through manual manipulation of the water surface with thin sticks. In the span of time before the ink sinks, we were able to play around with the shape of the marbling, swirling it around and giving it dips and swoops, engaging with the density of line and ink. 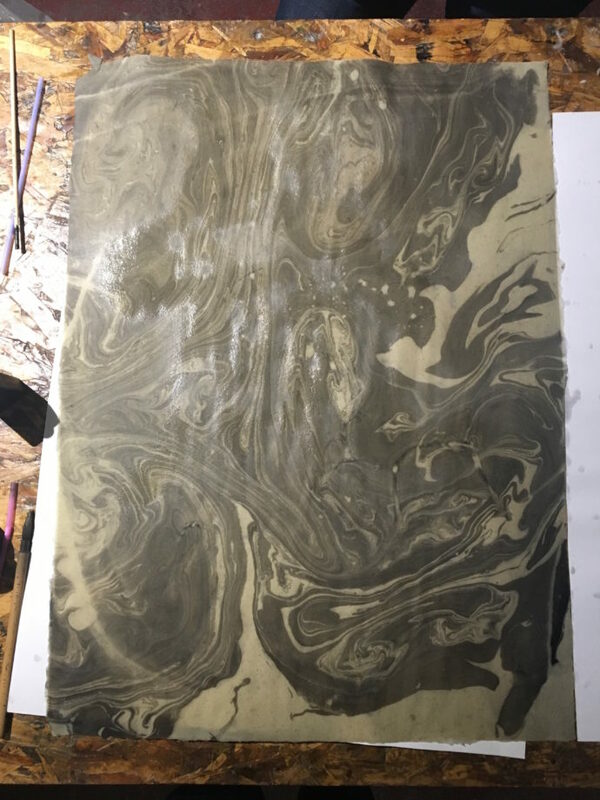 When the ink marbleization was well-balanced and we were satisfied with the results, we laid a sheet of handmade paper onto the surface of the water. It’s important during this step to tap the back of the sheet to make sure water’s surface meets all parts of the paper so that the ink will transfer evenly. While the idea is so simple, the effect of the delicately marbled ink on handmade paper is extremely beautiful and takes very few materials. It’s such a fun and satisfying process to work with! Some of the marbled paper we made ended up becoming the cover-papers for some very handsome hand-bound sketchbooks and notebooks, available for purchase from PaperTHINKtank at the Greensgrow Farms Twilight Market!